The Credit Suisse Gold Bar 10 oz is an iconic gold bullion bar which has been actively traded for decades. 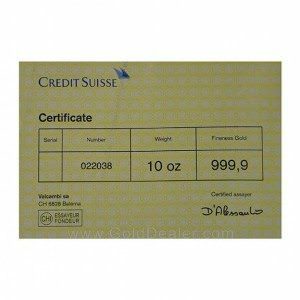 Credit Suisse is an international banking and financial services conglomerate with offices all over the world but the gold bar is produced in Balerna, Switzerland. 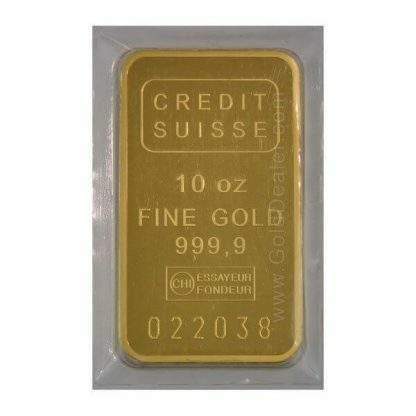 The Credit Suisse trademark has been synonymous with gold bars from 1 oz through kilo size since the early 1970’s and this brand recognition makes their gold bullion bar series a popular choice. 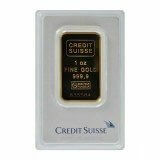 The Credit Suisse Gold Bar 10 oz features a sealed plastic holder which includes a white card with manufacture’s name. 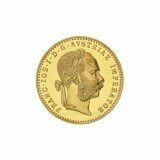 It is imprinted with the manufacture’s name (Credit Suisse), weight (1 oz), and purity standard (FINE GOLD 999.9). The bar also includes the important CHI hallmark and “Essayeur Fondeur” which means the bar is LBMA “Good Delivery” guaranteed by the famous Valcambi refinery. 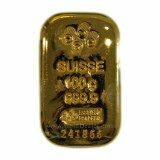 When investing in precious metals by weight the Credit Suisse Gold Bar 10 oz is difficult to beat for value and liquidity. The Credit Suisse Bar 10 oz is struck and so features sharply defined edges and brilliant surfaces including a unique 6 digit serial number imprinted on the front of the bar. The back of the packaging repeats the serial number and highlights the manufacturer and provides other technical information. 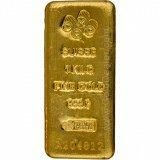 There are other reasons to own this bullion standard: (1) the premium over gold content on the Credit Suisse Gold Bar 10 oz is small and attractive to investors looking for a bullion product which fluctuates daily with the price of gold. (2) Because the Credit Suisse Gold Bar 10 oz is produced by a renowned refiner its content and purity is accepted worldwide. This allows traders to post daily buy and sell prices which assures liquidity. 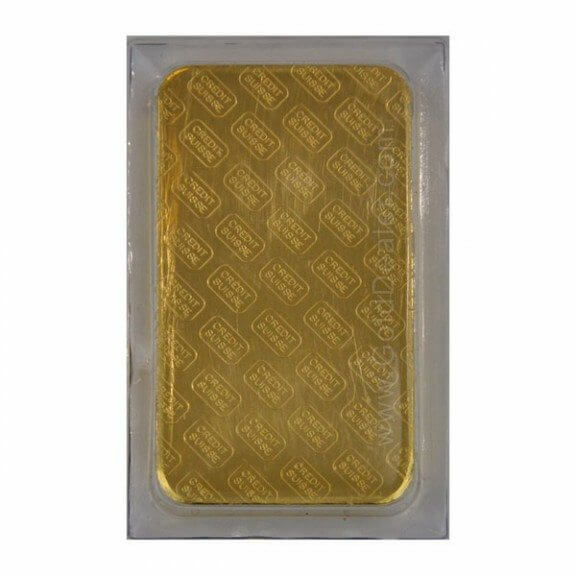 (3) Because the Credit Suisse Gold Bar 10 oz is pure it appeals to a worldwide audience including the Chinese and Asian trade. (4) The Credit Suisse Gold Bar 10 oz size is small enough to be convenient and also provides choices when buying or selling a larger gold bullion position. (5) There is no reporting requirement (Federal Form 1099B) for this popular gold bullion bar when you purchase or sell.